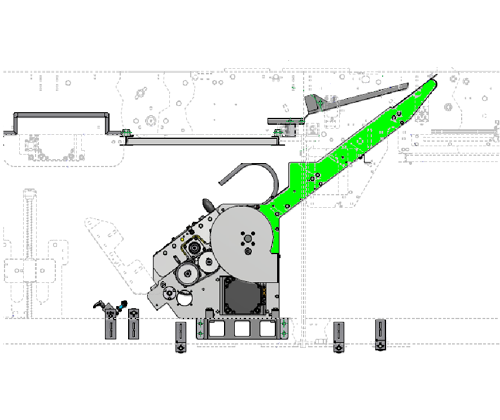 The upgrade consists in the complete replacement of the cutting group with the model installed in the SK shrinkwrappers. This is part of a series of retrofitting, available atwww.smigroup.it/profilo/smyupgrades, studied by SMI in order to upgrade to the latest version all the machines already installed on site. The new system SK type differs from the standard one for the presence of the film climb after the cutting group (green part) and for the application of a brushless motor on the cutting blade instead of the electric-pneumatic clutch installed in the previous version. The new system is extremely flexible and precise in transferring the film under the product to be wrapped; in fact, the centrifuge fan (blue part) creates a vacuum space in the chamber where the film is put onto the conveyors (yellow part), thus preventing any jams or anti-esthetic folds on the pack after the shrinking. 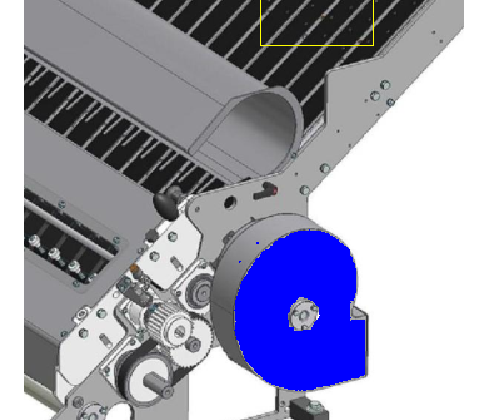 Another advantage of the film climb is the increase of the space for the film release, thus improving the film distribution and reducing the mechanical stress to which the functional group and the brushless motor (for the rotation of the belts) are subject. The new solution can be applied to a larger range of film lengths and thicknesses, ensuring top quality packs without film tearing. According to a cost saving policy, the new cutting group features new materials and new superficial treatments, in order to prevent attacks from corrosive agents, such as rust. Some surface treatments also increase the machine hygienic level, by making the cleaning operations easier. The new functional group is equipped with a brushless servomotor dedicated to the cutting blade only; furthermore, it offers the possibility to open the housing area of the cutter and of the rubber rollers, thanks to a series of hinges and spring plungers studied for this purpose. Thanks to the addition of the motor, the rotating speed of the cutter is independent of the film speed: as a consequence, the edge of the cut looks sharper and without fraying; moreover, the cutting operation is more efficient, also with thicknesses that were problematic with the old clutch system. The use of the motor instead of the clutch has eliminated any inefficiencies due to delay in response times of the components, such as the clutch opening spring, the activation valve and the locking cylinder. 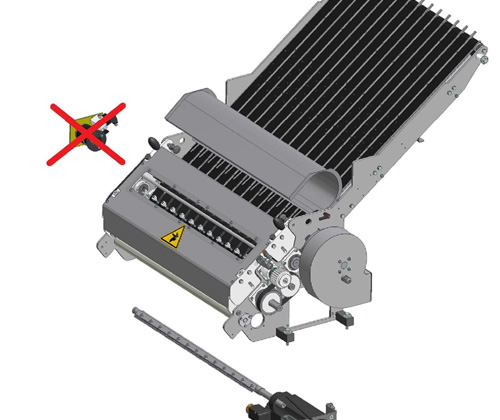 Another important improvement, which makes the maintenance operations easier, is the knife hinged opening: it is easier to intervene on a rubber roller or to replace the cutting blade, thanks to the possibility of opening the group. The blade area is also integrated with a window which makes the group inner parts visible, while it is operating, without affecting the safety levels, thanks to a transparent protection. As a consequence, it is possible to follow the cutting process and point out any anomalies from the privileged point of view offered by this window. The system will be equipped with the latest software release and will be more user-friendly, thanks to a synoptic chart of the machine instead of the command push-buttons that were used previously; anyway, it is possible, upon request, to supply the hardware and the new software functions, by maintaining the old graphic interface. If not specified in the offer, the supply does not include the installation and start-up of the new cutting group. - This upgrade is subject to verification by the spare parts department, in order to study the feasibility in case of shrinkwrapper with tray (type “T”). - This upgrade does not fit the shrinkwrappers with pad (type “P”). - In case of order, please send the database, in order to update the machine parameters, and the plate number of the POSYC (HMI) and MARTS (Plc in the electrical panel). - Better efficiency of the cutting in single, double and triple lane. - More reliable transfer of the film to the wrapping zone.